An analysis of feng shui techniques that are compatible with today’s emphasis on providing spaces that promote health and well being in the workplace. At Work Design Magazine we are always up for finding out new ways to approach workplace design. At a brief meet up after this year’s NeoCon with Dr. Sally Augustin, we talked about working up a story that was a bit different and that posed alternate ways of evaluating the efficacy of design solutions for today’s offices. One of the things we asked Sally was how scientific applications could also be applied to perhaps analyze the softer side of the effect environment has on people – how space makes us feel in addition to the measurable physiological effects that can be documented in more scientific studies. She wrote an article for us about this topic back in September. Sally also proposed a joint analysis of some workplace designs with her friend and, a colleague who is a feng shui master, Maureen Calamia. Sally mentioned that she and Maureen regularly value the same attributes in designed spaces. We were intrigued by the prospect, and after soliciting some images to use as examples from some of our favorite design firms, we are happy to present the findings. Sally’s background is in neuroscience and Maureen is a feng shui practitioner and student of biophilic design; the alignment of their analysis is what we find most exciting and a great example of where the intersection of art and science can be extremely informative. Environmental psychology rigorously and scientifically explores the impact of the built environment on one’s physical and mental health. It focuses on how things in our physical world influence how we think and behave. Feng shui originated in China and is a belief system in which there is a spiritual relationship between the physical elements of nature and human-made environments to create the right balance of energy for harmony in one’s space. Biophilic design, a modern design movement, acknowledges these foundations of feng shui and our connection to nature in our built environments and many biophilic designers also apply related research done by environmental psychologists. 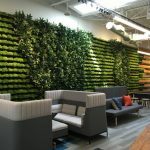 The confluence of these techniques is entirely compatible with today’s emphasis on providing spaces that promote health and well being in the workplace. In that, a picture is worth a thousand words. We selected several images and asked Sally and Maureen to evaluate them concerning their background and expertise. From a feng shui perspective, our first image displays the essential five elements of feng shui which connect us to the natural world – wood, fire, earth, metal, and water. Earth is represented by the horizontal plane of the large communal table and the inclusion of decorative pottery (earth-based material) in the shelving at the back of this photo. Fire is represented by the variety of light fixtures and natural light from the windows. Wood is represented using the material in the communal table and chairs. Metal is represented using the color white and metal finishes on the chairs, lights, and other objects: water via the glass top on the table and blue on the bench seating. Also, the wall covering over the bench evokes the image of gentle rain. Space is flooded with natural light, yet the light is diffused with the drapery. The open weave fabric reduces glare (a stress inducer), thus creating a more harmonious environment. Both science and feng shui agree that natural light is vital for human well-being. Maureen and Sally also agree that the fact that space offers a variety of environments providing prospect (a view of the neighboring area and the people in it) and refuge (sense of security) for example via the high back chairs enhances mood and wellbeing. In feng shui terms, this is called command or power position and is essential for feeling secure in the room. There is a right balance of visual complexity with the choice of materials and patterns (smooth and textured); science indicates that moderate visual complexity helps us keep our stress levels in check, for example. According to feng shui, these design elements provide a balance of yin and yang that contribute to a sense of harmony. Per Sally, the mix of items in this image offers a calming environment and are put together in a way that is not overwhelming – thus putting them in the right psychological space for work. Our second image also uses design techniques to provide a great work environment. First, the variety of spaces provide occupants a sense of control by having a choice of places to work. This layout with nooks off the main area plus a selection of furnishings offers a space for prospect and refuge (aka command position). The man in the yellow chair has a good view of people coming and going, yet the high back provides a sense of enclosure in the open space. Subconsciously we look for a position that offers the most sense of comfort and safety. For example, science shows that in a meeting the leader will most likely take the place with a view of the door – which gives a sense of control by being able to see who may be approaching or entering the space. According to both disciplines, our brains are wired, at the most fundamental level, to maintain a sense of control and security, which these design elements provide. Other factors contributing to the effectiveness of this design include the use of live plants as a design element. According to feng shui, plants and the abundance of natural light give a sense of vitality to space, and psychologically they trigger a positive response, as green can contribute to stress reduction and enhance creativity – which is excellent for professional performance. Science indicates that green leafy plants help us cut stress and thereby focus on the task at hand and also support cognitive refreshment and creative thinking. The pots are a natural material, and the natural light is great for mood. When people are in a better mood, they get along with others and excel at their jobs. The curves of the lighting fixtures and furniture introduce softness to often-angular spaces and support optimal sensory stimulation. Science has shown that we link curvy shapes with comfort and more angular ones with efficiency; spaces that feature curvy design elements seem more comfortable to us. In feng shui terms, this is called the contrast of yin and yang, which are complementary opposites. Just as in the previous image, yin and yang represent soft and hard surfaces, smooth and textured material, subdued and bright colors, which are shown in the right balance in this space as well. White open spaces are yang, while wood material, enclosures, and plants are yin. The angularity of the room is contrasted using the roundtables and rounded design details on the furniture. All create a sense of balance thus a comfortable environment in which to work. A view to the outside and nature provides positive feelings and are ways to bring the yin into the yang of most office spaces in feng shui and support the critical process of cognitive refreshment, which is well-researched by scientists. Both Sally and Maureen felt that the dividers were a hugely successful design element. Not only did the wood bring the natural element into play, but the dividers also create a more human-friendly proportion to space. Research has shown that seeing the wood grain can de-stress us. The woven screens give groups a sense of having their own space, which is a performance plus. As you follow the commentary on all our images, the sense of enclosure is probably one of the most critical features needed to support the more open workspace. People are territorial, and a division of space offers the opportunity for people to pick and choose well-defined space within the larger environment giving that sense of security and protection needed for a calm mind. 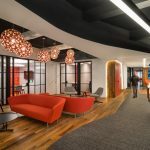 Our third example illustrates another key trend in today’s workspace. Multi-use spaces for work and collaboration have proliferated over the past few years. The break room is no longer a dark little space, and people are no longer relegated to one desk or place in the course of the workday. This space can manage several people and activities simultaneously, and the design supports them by offering variety in seating, postures, materials, and lighting. Feng shui-wise this space incorporates a balance of yin and yang which also aligns with positive cognitive reactions when there are a balance and compatibility of design elements within a space. High points of this space, science-wise, are the views of nature, the flow of natural light, use of natural materials, and variety of use options. The symbol for Yin and Yang – defined as (in Chinese philosophy and religion) two principles, one negative, dark, and feminine (yin), and one positive, bright, and masculine (yang), whose interaction influences the destinies of creatures and things. Coordinating the interior with the exterior. This workspace is immediately adjacent to an outdoor patio. This is a novelty in the office environment, but in this case, the Southern California location provides the opportunity to expose occupants to and create a connection to natural light and views to the land and weather patterns. The softness of nature versus the hardness of built environment. Nature views give a sense of depth, vision and create a sense of place. The variety of materials express the yin/yang by use of hard and soft materials (e., wood and metal), a variety of lighting sources (natural and artificial), shapes (curved and angular). Depending on how space is accessed, from the main entrance there is a command position (prospect) where the woman is seated. Her back is supported and protected by the divider and bench seating. Our last image expands our view to a larger multi-level area within a workplace. Our experts loved the way these design elements created a sense of place with the subtle yellow gold wall graphic– connecting to the local geography and landscape: the desert. Connecting people to the land is a foundation of feng shui and is echoed in biophilic design. It reminds people that they are not just in a generic office building. Linking people to the outside world gives psychological comfort and restocks mental energy. There is power in using art and photography to provide images of nature. Positive aspects of this space, based on environmental psychology, are the presence of natural light and the opportunities for prospect and refuge in the high-backed seating areas on the lower level. The round aqua rug clearly defines the gathering area at the top of the stairs and use of different flooring materials delineates different work areas. Having use options gives people some control over their experiences, which is excellent from the perspective of psychological comfort. The design provides people with an opportunity to walk and walking has been shown to boost our memory function and ability to think creatively, even after we stop moving. Adding some curved lines in the furnishings also ups our comfort levels in this space. Bookshelves are a resource – this is a meaningful way to provide and recognize tools people need, and when you supply them, this can have a significant positive effect on performance because it shows respect for employees and their work. Nonverbal messages that convey that employees are valued, and their contributions to an organization respected, are fundamental to effective workplace design. Prospect and refuge (aka command position) in the use of the banquets on the lower level (sense of enclosure) as well as the clear view provided by the glass railing from upper level to lower. Wood-grain carpeting helps to provide more yin (representation of natural material and softens sound) into this space. How does space make us feel? We had fun doing our analysis and comparing notes on how different disciplines examine this topic. Not surprisingly, this ancient practice of arranging our spaces has much grounding in our psychological response to space. Our goal was to provide food for thought for those in the process of working with clients to find the optimum work environment to meet their companies’ specific needs. We are finding out that one size does not fit all, and that the generic office designs of the past – cubicle farms, designated enclosed and assigned offices, static meeting rooms, pantries only for getting a coffee and storing your lunch in a communal refrigerator are not the way of the future. Dr. Augustin edits Research Design Connections. I loved reading your article, Sally, Maureen and Elise. It is always interesting to look at how the art of Feng Shui is incorporated in modern office architecture and design. It is true that Biophilic design also acknowledges the foundations laid by Feng Shui. I would like to add that adding green elements like small planters in your office will help you lift the ambiance of your office and increase the efficiency of your employees.